Now here is a great idea! 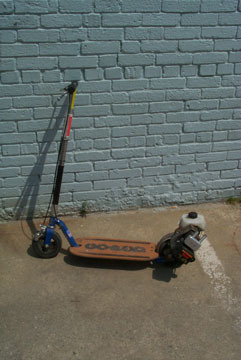 Buy a goped without a motor (a knowped) and put your own motor on it. 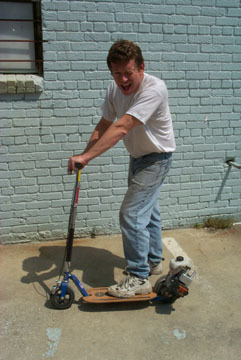 This scooter is a Knowped which has a Ryobi 31cc weedwacker motor driving it. The motor has a few performance tweaks including high performance muffler from a remote control airplane, ported cylinder, and compression boost. The spindle is made out of schedule 80 high pressure 3/8 inch pipe. It has stainless welding rod cut into 2 inch pieces and welded around the periphery to increase diameter. This actually gives the spindle greater grip on the wheel, requiring less pressure against the wheel. Spindle is about 0.85 inches. The wheels are 6 inch diameter, as what comes on go-peds.